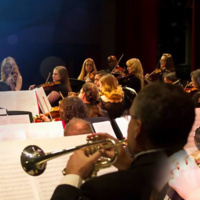 The Santa Clarita Philharmonic presents its winter program and the winner of its fifth Student Concerto Competition, which is open to junior and senior high school students throughout the Santa Clarita Valley. The winning student will perform with the orchestra. The program also includes selections from Broadway shows, Hollywood film scores and other popular music.